According to Fox8live the National Weather Service in Shreveport says they picked up a debris field on radar Monday afternoon ( October 13, 2014) at the same time many people around the ArkLaTex reported hearing a loud boom. Image: Weather map shows debris field. 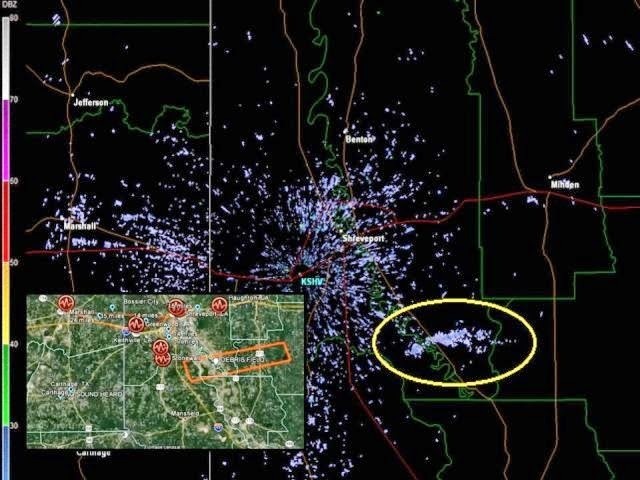 According to Senior Forecaster Marty Mayeaux, the radar image appears similar to the debris field that was seen as a result of the explosion at Camp Minden in October 2012. Only this time, it appeared to originate in an area south of Wallace Lake in extreme northern DeSoto Parish, east of I-49. Mayeaux says it showed debris was indicated rising 1,000 to 1,500 feet into the air, and that it drifted eastward toward Bienville Parish. There was no precipitation in the area at the time, as the storms that moved through Monday were well into eastern Louisiana by 4:30 in the afternoon. According to media reports military, refinery, and pipelines are not responsible for the Boom. But it gets even stranger, on Wednesday (October 15, 2014) a resident of Washington noticed in a WeatherPro application on his Iphone a strange phenomenon and reported it directly to Mutual UFO Network, case 60567. The Weather map captured a possible contrail of something going what appears to be from North Carolina to estimated destination of Pyongyang North Korea around the time of 22:00GMT/17:00EST. The resident of Washington has spliced the pictures together and it shows the track of the possible contrail. Does anyone have an explanation for these strange events? Tonight in southwest Arkansas at 5:35pm on 12-20-2015 my family and I heard a very powerful boom straight out of the Eastern sky about 10 o'clock high. This boom was so powerful it shook my body, and wife ran out of the house thinking something exploded our yard. The closest town to my home is Doddridge Arkansas. What could of made such a powerful sound in the sky?? ?